How does a physician diagnose a ganglion cyst? What are the symptoms in connection with a ganglion cyst that will lead a patient to seek medical advice? What other examinations are required when dealing with a ganglion cyst? Can one assume that each swelling to the back of the wrist has to be a ganglion cyst? What needs to be done in a case like that in order to distinguish a ganglion cyst from a rheumatoid condition affecting the hand? Is there such thing as a ganglion cyst in the bones of the wrist? In the majority of the cases a palpitation suffices to confirm a diagnosis. Some ganglion cysts are so small that one can hardly see them on the surface. In isolated cases (particularly when a ganglion cyst is barely visible on the surface) an ultrasound examination may be helpful. 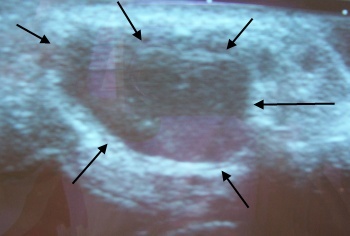 The image shows a ganglion cyst on an ultrasound picture. The dark area depicts the liquid material within the ganglion cyst. Another reason for an ultrasound examination in case of a suspected ganglion cyst is when the ganglion cyst is located in an untypical location. The symptoms connected to a ganglion cyst may vary quite a bit. Particularly small – almost invisible ganglion cysts – can be very painful. A pain-conducting nerve enters the wrist in the same position where the ganglion cyst emerges to the surface. The ganglion cyst presses onto the nerve. Larger ganglion cysts of the wrist many times are much less painful. They are more bothersome because of their appearance. Many times an x-ray image is produced in order to identify associated damages to the skeletal system or the ligamentous apparatus of the wrist when dealing with a ganglion cyst. 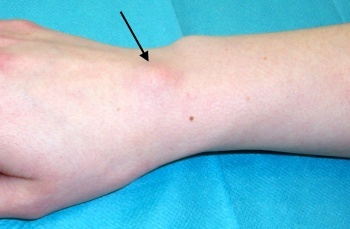 A ganglion cyst may occasionally develop in connection with a damaged ligament within the wrist or due to another condition affecting it. If the x-ray does not provide absolute certainty it may be necessary to turn to an MRT-image (magnetic resonance imaging). Particularly in the case of a recurrent cyst it is of utmost importance prior to proceed to a second intervention to obtain a precise clarification as to whether there are damages in the wrist that could be conducive to the development of a ganglion cyst! The image shows a magnetic resonance tomography which was produced in connection with a recurrent cyst. 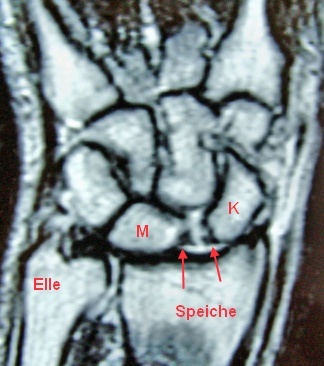 The magnetic resonance tomography shows a ruptured ligament between scaphoid bone (K) and lunate bone (M) as cause for the symptoms and the swelling on the back of the wrist. 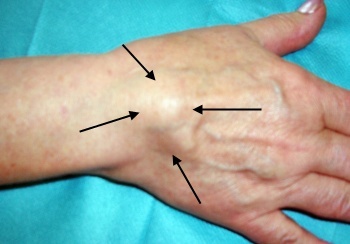 The image shows a swelling on the wrist of a sixty year old woman. At first sight the swelling looks similar to a ganglion cyst of the wrist. No! The ganglion cyst of the wrist is by far the most frequent cause for a swelling to the wrist however, there are other conditions (or after-effects of injuries) that need to be taken into account. A rheumatoid arthritis for example, may lead to a swelling similar to a ganglion cyst! In the course of the examination a rheumatoid condition could be identified as culprit for the swelling. When dealing with this suspicion a lab test in order to differentiate from a chronic polyarthritis is necessary. A rheumatoid arthritis (=chronic polyarthritis) in eighty percent of the cases can be confirmed through a rheumatoid marker in the blood! Yes. Ganglion cysts may occur in carpal bones. However, this is rather uncommon. Such intra-osseous (located within the bone) ganglion cysts can be detected in a regular x-ray in most cases.